If you’ve not started selling your BigCommerce products through Rakuten, here’s how you submit your product feed. How to upload BigCommerce product feed to Rakuten? What has changed in ExportFeed BigCommerce app for Rakuten Marketplace? When you create your product feed for Rakuten, it is important that you map your product categories of BigCommerce to that of Rakuten.com. Not only this is necessary because you are able to list your products correctly but also to increase the searchability and improve the conversion aspects of your products. This update of our cloud service app helps you make accurate product mapping and allows you the benefit of increased sales revenue for your BigCommerce products. Rakuten feed specification on category template for Inventory SKU has gone through a major overhaul recently. One of the major change that Rakuten has made to it is that you don’t need to send the seller Id in the feed. 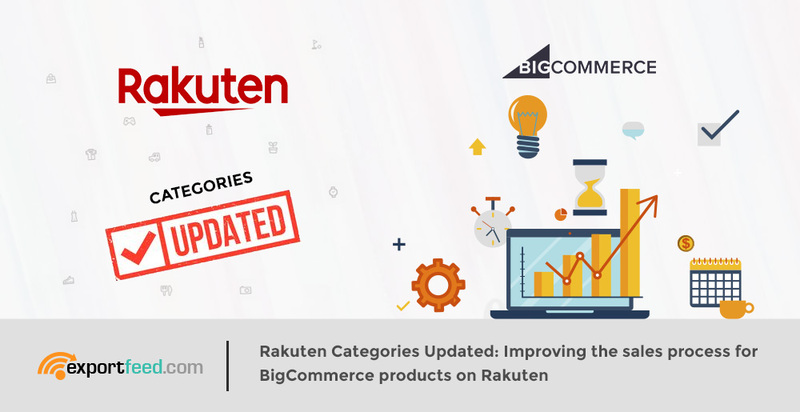 To adapt and keep your BigCommerce product feed compatible for Rakuten, we have also changed our ExportFeed Rakuten product feed output file. The product feed that you create through our BigCommerce app is now completely compatible with the new Rakuten feed specifications.